Day 6: What did you learn? Compare the “you” from the beginning of 2012 to the “you” that you are now. What new skills or talents have you learned or discovered this year? The one thing I started doing this year that I’d never done before was letterboxing, and as a result of this I have become reasonably good at using lino cutters to carve rubber stamps out of common-or-garden erasers, which is something I’d never attempted before. I have found some letterboxes made by other people whose skill has left me in awe (The Hero of Sherwood is spectacularly good; unfortunately I can’t show you a picture) but I’ve managed to make a few stamps that have a recognisable picture. I’ve become competent at cycling on the road. This is mostly confidence and etiquette, but it bears mentioning. There were various nifty little tricks I learned on various Microsoft programs, but that’s boring. 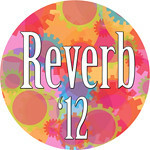 Sometimes I spend too long at the end of the year planning for the new year ahead, so something like #reverb12 is so good for me. This year was so full of change for me and mine that it feels like it wasn’t a “good one”. While I welcome the fresh breeze that change can bring, too much change just leaves me itchy and skittish, the ground loose beneath my feet. Then, when things settle again and the road ahead looks smooth and delightful, I think – what’s next? But I need to remember to look back at the winding path before I start walking. I think the most important thing I learned this year was that ‘I ought to’ is a very bad reason to do anything. I had run myself into a wall with ‘I ought to’ and had lost sight of what was actually important for me. When I had learned to reformulate every ‘I ought to’ into either ‘I want to’ or ‘X needs doing’, I was able to see much more clearly where I was, what needed doing, and whether it needed me to do it. Then I was able to do it, but in a way that did not stress me out, or not do it, and not feel guilty about not doing it. It has allowed me to do things – some of them very big, scary, things – on my own terms. The whole thing broke a very damaging pattern and I very much want to remember it, and take it forward into next year with me. This entry was posted in reverb and tagged personal, reverb12, writing process. Bookmark the permalink.